Good timing: With the main races start- ing after six o’clock in the afternoon, the temperatures are usually cooling down by the time the competition heats up. 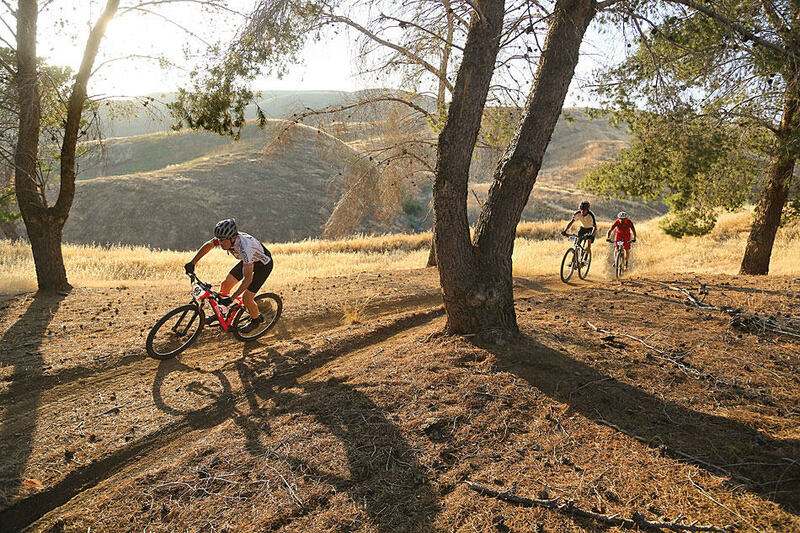 Cross-country mountain bike racing has returned to the Los Angeles area for the summer of 2016. The eight-race PedalFest series is held in the park next to Lake Castaic, roughly 40 miles north of downtown Los Angeles near Interstate 5. Races are held on Thursday afternoons starting around 5:30 p.m. The events began in late May and end in August, with a five-week break scheduled in the middle of the series to give everyone a few weeks off. The ad guys: Mountain Bike Action advertising salesman Derreck Bernard put in a strong effort on opening day. Derreck also competes in triathlons on the side, so you know he’s fit but his real strengths lie selling advertising. So when you eventually catch up to him, tell him you want to buy an ad. Derreck “Catch Me If You Can” Bernard can be found at [email protected] or call him at 661-367-2153. The PedalFest series was the brain-child of promoter Greg Flanagan, who previously promoted the Over the Hump series races in Castaic in 2013 and 2014. Those races were run in conjunction with the Over the Hump race series in Orange County, California, held about 40 miles south of Los Angeles. Flanagan’s wife Gina, one of the top women’s cross-country riders in the area, came up with the name PedalFest. This year Gina has been working with Greg behind the scenes, helping to keep everything running smoothly at the events, along with a team of about 20 volunteers. Rolling waves of grain: The hills surrounding Lake Castaic provide a beautiful setting to the race action. The races are open to riders from 6 years old all the way up into their 60s and 70s, or even beyond. The youngest riders race in the 6–8 age group, while the old- est riders race in the 60 and Over class. Race lengths vary according to age and experience levels. The youngest riders do a single lap of the one-mile course, while the next oldest group, the 9- to 11-year-olds, do two laps of that circuit. Sweeping turns: The downhill sections are fast and flowy with few opportunities for passing. Racers 12 and older face longer, more challenging courses. Beginners ride a single 3.8-mile loop for their race, which usually takes about 20 to 25 minutes. Sport, super-sport, Clydesdale (for riders who weigh 200 pounds or more) and single-speed racers do three laps of a 4.2- mile course. The kid makes good: Long-time Mountain Bike Action test rider Spencer Rathkamp AKA-“The King of Wheelie Wednesday” ruled the Pro Men’s Cross-Country division in the opening round of this year’s inaugural PedalFest race series. Fast descents: The returns to the valley floor were a whole lot faster than the climbs coming up from the bottom. Expert- and elite-level riders ride four laps of a slightly longer, more challenging course, which typically takes them roughly 65 minutes to complete. By the time the last stragglers in the races finish, it’s usu- ally getting close to 7:30 p.m. The podium ceremonies kick in after that, and most people are on their way home by around 9 o’clock. Challenging competition: With over 200 racers showing up on opening day, riders faced spirited competition in their categories. Last lap: The racing ends a little after 7 p.m. as the sun is sinking low behind the hills. There is typically a turnout of between 200 and 300 people per race, but it changes every week. Mr. Flanagan hopes to get 300 riders a night. The volunteers who help put on the races get a free T-shirt, according to Flanagan. “I’ll trade a race entry, too, if they’re a racer,” he adds. One of the best things about the race series is the fun, low-key atmosphere. Naturally, the best racers are trying their best to win, but they’re often close friends with their toughest competitors, so the riders commonly stay at the venue until well after it gets dark, sharing their battle stories from the day’s events, meeting other riders and then maybe getting a bite to eat before heading home. Pitched battle: The climbs can be tough for even the strongest riders. Less- experienced riders face an easier race course that keeps them on the lower portions of the hills. Fun course: Riders have a fun and beautiful course to enjoy in the series. For riders who want to try their hand at racing and see how they do, the series is a great way to check out one’s skill level without having to travel to a national-level event. For riders who are already racers, the events are an excellent way to test their fitness and see what they need to do before they head off to the bigger events.